Subaru UK has announced pricing on the all-new 2014 Forester and the new crossover 2.0D X diesel variant will be very competitive. Subaru UK has confirmed pricing on the new fourth-generation 2014 Forester and they offering the new crossover with competitive pricing and especially the 2.0D X diesel model. Subaru has experienced poor sales of some of its models in the UK and they want the new 2014 Forester to succeed in a big way. The all-new Forester will go on sale in May, and despite the new fourth-generation model getting a complete remodel, the new pricing will get a small bump in price from the outgoing model. Subaru offers the new Forester in a diesel variant with very competitive pricing that those in the U.S. would love to have, but can only salivate over for now. Will Subaru ever offer a diesel variant in the U.S.? 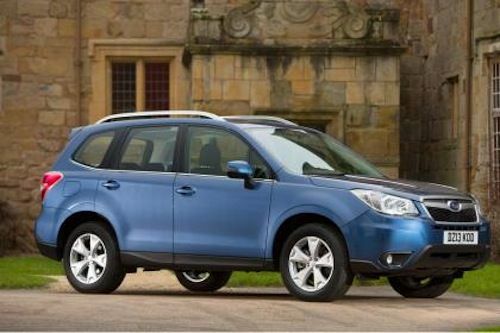 The new 2014 Forester received a complete makeover and those in the UK get excellent pricing. Prices will start at £24,995 for the diesel variant 2.0D X, rising to £30,995 for the range topping 2.0i XT. The fourth-generation Forester builds on the strong reputation it has in the UK for a go-anywhere, user-friendly SUV that comes with improved performance, safety and efficiency and a more spacious and better appointed cabin. Subaru customers in the UK are a lucky bunch and are the envy of those of us in the U.S. market who can only dream of having a 2014 Forester diesel variant to buy. The Japanese automaker doesn’t offer any Subaru diesel in North America for a number of reasons, and UK buyers get a tremendous value for the new 2014 Forester diesel model. UK buyers not only get the new Forester with Subaru’s unique Symmetrical All-Wheel Drive system, improved driving refinement and a low center of gravity due to the horizontally opposed Boxer engine design, but they get the efficient Boxer Diesel powerplant to go with it. Subaru built their first diesel back in 2004 and incorporated the horizontally opposed boxer technology into their diesel engine. The design cancels out inertial forces that cause vibration and noise, thanks to their horizontally opposed pistons and requires no balance shafts. The design is unlike inline diesel engines in that the Subaru Boxer Diesel features low vibration, a low center of gravity, and high rigidity. At a competitive price of £24,995 for the diesel variant 2.0D X, it should be their most popular model in the UK. All 2014 Forester 2.0D X variants are powered by a turbocharged 2.0-liter four-cylinder horizontally-opposed Boxer diesel engine, producing 110 Kilowatts of power (147 hp) and 350 Newton meters of torque (258 lb ft). Subaru has not announced technical specifications yet and will officially release them on April 15th. But we know the diesel 2013 Outback 2.0D CVT variants get a combined cycle, fuel consumption 6.5 liters per 100 km and carbon dioxide emissions 172 grams/km which is impressive. The diesel Forester should prove to be very clean and fuel efficient also. In addition to the Boxer diesel, Subaru will introduction a new 2.0-liter direct injection turbocharged petrol engine, producing 240ps. All the engines have significantly improved CO2 and economy figures over the outgoing model. Customers in the UK can expect to see the all-new 2014 Subaru Forester diesel and petrol models to arrive in showrooms coming this May. U.S. buyers can only wait and dream about a Forester diesel variant. Hi! Just asking if 2014 Suburu Forrester Diesel will be available in the Philippines? If yes, around when?